7.67 points at 15 votes (rank 154). 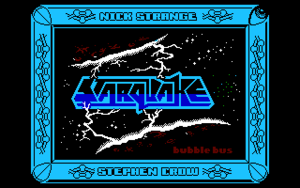 Starquake is an arcade actionadventure, which spans over 512 screens. You need to collect single parts of the planet's core, which are scattered randomly everywhere. There is no scrolling, the single screens are shown in the flick screen principle. The universe faces a deadly threat again. Happily ignoring the laws of physics, a highly instable planet came from a Black Hole and now threatens to start a chain reaction by collapsing, which will destroy the whole galaxy. Only when all the single parts of the planet's core are put together again, the catastrophe can be avoided. Equipped with a rapid hoverpad, Blob jets through the innards of the planet. All the heros that would have come to consideration for this rescue mission, have preventively taken to their heels, so that there is only one nominee left, who has no outstanding brainpower, but has even more enthusiasm. 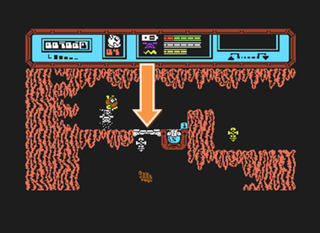 As the first official act as saver of the universe, "Blob" (Biological operated being) makes a perfect crash landing on the surface of the planet. Furthermore, he has to recognize, that the inhabitants of the planet are completely unaffected by his noble mission and attack him fraught with ingratitude. This and the fact, that the planet is a huge labyrinth of interconnected caves, make his mission not simple at all. Blob is equipped with four lives, limited ammunition and the possibility to carry up to four items. Furthermore, he can - as long as he moves on foot - create a number of artificial bridges which enable him to reach locations which are difficult to access. However, these bridges only last a few seconds and then vanish into thin air. To build a bridge the joystick is moved down. Blob has enough material to work his way up over three screens. Backgrounds and sprites are desgined lovingly. Although they have a certain "spectrumesque" touch, they are rich with details and squiggles. Lots of strange plants, tendrils and other ornaments please the eye and every section of the planet has its own style, which makes for much diversification. The sound is also well done. The sweeping start tune could be without problem by Jean-Michel Jarre, really gooey. There are added several jingles for the startup-screen and the highscore table, as well as a great deal of spacey effects with much reverberation and echoes. If nothing is going on, the ears are coddled with a trippy ambiance of authentic whistling and sough, which suggests a feeling of vastness and lostness. 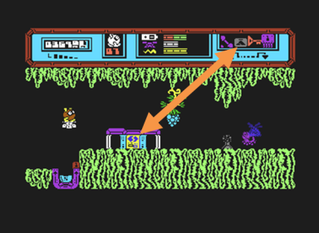 Although Blob could also use the platform in the lower left to leave the screen to the top, he prefers to build a bridge. 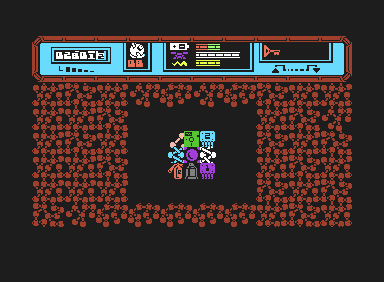 Blob is attacked by a finite number of aliens that move around randomly and subtract life energy from him at contact. With the help of his laser he can defend himself, but he uses up ammunition. Blob can collect energy, ammunition and bridges by touching one of the numerous bonus items. The parts that are needed for this, are alloted anew before every start of the game and the items are scattered at random positions. So Blob has to make a short visit to the planet's core first, to get to information about which parts are needed. 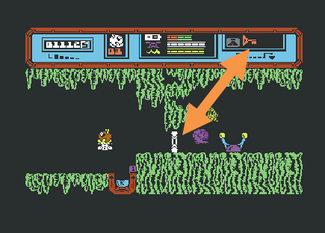 If one of the required items has been found, Blob can pick it up - if he is walking - by standing on it and moving the joystick up. The item then appears in the inventory at the top right. This way, up to four items can be picked up. If a fifth item is picked up, another item is put down instead. If Blob visits the core, the fitting parts are removed from his inventory and transformed to bonus points. Not fitting items are not fully redundant, you still can swap them (more see: Cheops Pyramid). As you can see, the planet's core consists amongst others of such obvious items as e.g. fire extinguisher, a spray can and a 5.25 inch disk. Although Blob is going astonishingly fast with his short legs (and is making an adorable pattering noise), his possibilities to move upwards are limited by the number of his artificial bridges. When these are used up, he can only move to the left, right or down, i.e. fall. Blob can jump from any height and land safely. But he has to take care, that he will not land inside an area from which he cannot escape without his bridges. This would mean a Game Over. Therefore the following further means of transportation are recommended: hoverpads, teleporter, lifts and secret passages. Hoverpad starting and landing spots are easy to find and offer Blob free movement into all directiosn. As long as he flies in an hoverpad, Blob can, however, neither pick up or put down parts of the planet's core nor use teleports, lifts, security doors or secret passages. He first has to find a parking spot. 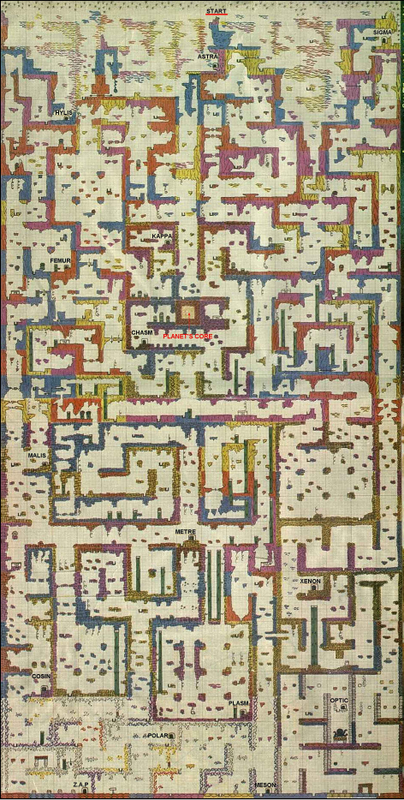 There are altogether fifteen teleports scattered over the area which are connected to each other and can be used to cover great distances fast. If you enter a teleport, you enter the five-digit name of any teleport and you will be transported there seconds later. Teleports can only be entered by foot. Lifts transport Blob only upwards, prematurely leaving the lift is not possible, so you sometimes are moved up through whole screens. Furthermore, lifts protect Blob from enemies. They can only be entered by foot. Such rectangular gaps hint to a secret passage into a neighbouring screen. Sometimes Blob can shorten dangerous or complicated routes with this. Secret passages can only be entered by foot. Some areas of the map are barred by security doors or barriers. To cross them, special items are needed. Security doors can only be passed if Blob carries an ACCESS Card . For vertical barriers he needs a key . Blob can break through horizontal barriers, by letting himself fall on them. He CANNOT break through the barriers from below. You should give these four friends a wide berth. Normally, the contact with aliens only takes away energy. But there are two types of aliens, that immediately make you lose a life when getting contact. The first type looks like a rotating gyroscope, the second like a chain-driven tank, that discharges flashes. The gyroscope can materialize anytime in a herd of normal aliens, so you need to keeep distance from those places. Hedgehog-like plants and things that look like broken bottles are also deadly. An electrode, a passage electrode and a dead electrode. The same can be applied for discharging electrodes. Every electrode has its own rhythm, which needs to be watched for to be able to pass umharmed. Some electrodes block narrow passages. Dead electrodes (depicted right in the image) exist, but appear seldom. They can be found every now and then. If you have the Access-Card , you can swap a useless item that you carry with you against a maybe more useful item with . The names of the teleports are: Astra, Kappa, Hylis, Femur, Sigma, Malis, Meson, Optic, Xenon, Plasm, Metre, Polar, Cosin, Z.a.p and Chasm. The planet's core can be reached by the teleport "Chasm". Get out, then fly one screen up and two to the right. As very first action go to the planet's core and memorize what parts you need. Keep away from materializing aliens. One of them can well be a deadly gyroscope. The game remembers the position of the aliens when you leave the screen. Only when you enter another screen, this information is deleted. So it can happen, that you run into a deadly alien, when returning precipitously. As ammunition is rather scarce, controlled shooting is on the agenda. Immediately pick up key and access card. 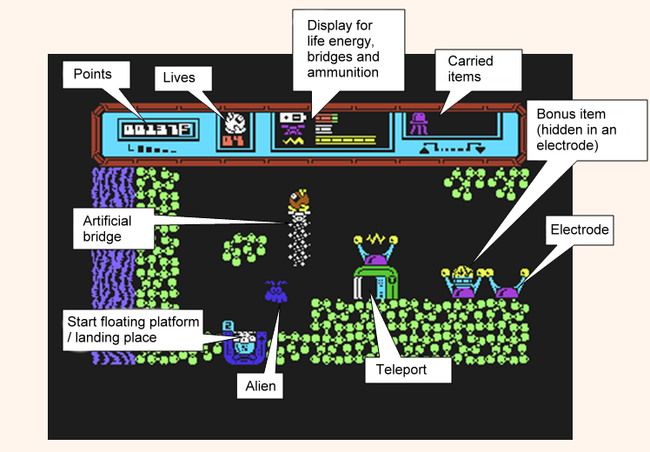 Robotron2084: "What a game! Starquake is in my opinion the absolute high point concerning action adventures (with emphasis on action!). There is really a lot happening nonstop, so you sometimes get dizzy. Graphics and sound fit together ideally and create a real space atmosphere. Added to it is the latently gleaming humor everywhere and an absolutely loveable-daft-funny hero. Only the quasi immense difficulty grade clouds this experience. However, I give 9 out of 10 points without hesitation and a warm recommendation for this game. 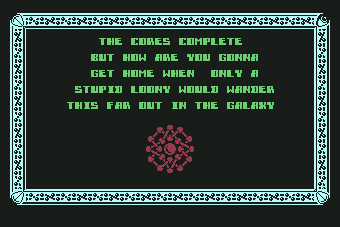 The C64 at its very most!" 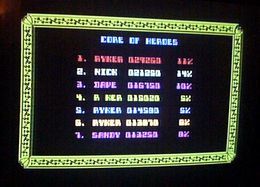 Borna: "This was my first so-called action game in the look unsual at that time. When I had read the objection of the usually very reliable testers against this genre in the legendary Games Special 2 of the Happy Computer, I could not comprehend what was so bad about that. 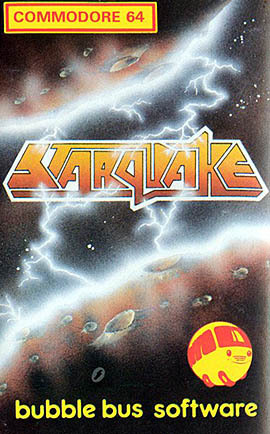 The answer to this problem: Starquake posed an absolute exception and the critic in the Happy Computer referred to the rest of the genre - the graphics, the sound (!) as well as the mass of well-coordinated features in the game seemed so compact, that they could afford - sorry - the ridiculous joke at the end that everything was done for nothing. 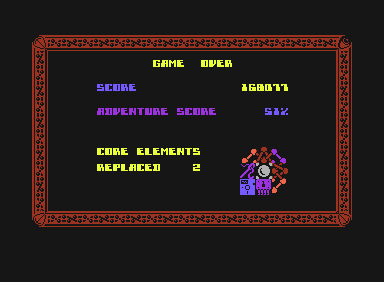 Sure, it was hard as hell; but with the passwords, shortages and small gimmicks as the Cheops Pyramid and keycard the game was feasable to an extent, that made you play it again and again. This game is a real jewel!" Not only is the game really very very hard, no, that is not enough! If you should make it, contrary to expectations, to collect all the parts of the planet's core, you will be mocked extermely... very mean!!! Mockery and derision as as thanks! The last parts of the planet's core are collected.